Jayden Stockley vindicated his inclusion with a stylish deciding goal as Aberdeen returned to winning ways against Partick Thistle. 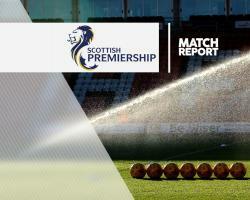 The striker marked his first Ladbrokes Premiership start since August 13 with his third league goal for the club, guiding a left-footed chip into the top corner in the 53rd minute to secure a 2-1 victory at Firhill. Adam Barton had headed an equaliser two minutes earlier after Anthony O'Connor converted following a set-piece six minutes before the break. Thistle had come into the game as the form team following two consecutive wins while Aberdeen had lost their previous two games, but Derek McInnes' team returned to second place. Both teams lined up with two strikers, Kris Doolan and Ade Azeez starting their fifth match in a row for the hosts while Stockley joined Adam Rooney to go up against Thistle's three-man central defence. Stockley provided the early threat, getting a header and a shot-on-the-turn on target. Azeez then had a better chance when a long ball caught out the Dons defence, but Joe Lewis did not need to stretch his 6ft 6in frame to catch the striker's attempted lob. Thistle twice threatened from corners, Azeez sending an overhead kick above the bar before Danny Devine slid in to meet Sean Welsh's inswinger in the six-yard box but skied over. Aberdeen winger Jonny Hayes just missed the target with a long-range strike which dipped and swerved but the visitors were soon ahead. James Maddison flighted in a ball after Aberdeen won a free-kick 10 yards inside the Thistle half, Andrew Considine won the initial header and O'Connor drilled home from seven yards following Rooney's lay-off. Thistle came in determined fashion after half-time and Lewis made saves from from Doolan's 20-yard shot and team-mate Shay Logan's looping header before the home team equalised in the 51st minute. Welsh hung a corner to the back post and Barton got in front of Kenny McLean to head into the top corner despite being pushed in the back by the Aberdeen midfielder. But the home fans were silenced by a brilliant piece of forward play from Stockley. The former Bournemouth player won a high ball and quickly turned to run on to Maddison's through ball and, spotting Thorsten Stuckmann well off his line, chipped the ball into the top corner from 20 yards. The Jags struggled to find any way back and Stuckmann made saves from left-back Graeme Shinnie and Rooney before Lewis comfortably held late strikes from substitute Chris Erskine and Devine.